At one time or another we’ve all had to apply eye drops – as a prescription to treat an eye related illness, to relieve dryness, to stop itchiness or to refresh tired eyes. And the truth is- most of us detest it. Putting eye drops in your eyes is like changing the oil in your car with one hand. It requires getting in an uncomfortable position, being precise, and having dexterity and patience. And if you are not careful, you get the stuff all over yourself! Fortunately, there are many devices out in the market designed to make administering eye drops easy! 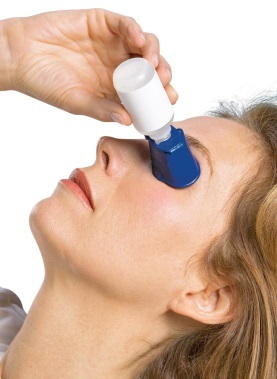 The Autodrop Eyedrop Guide is a soft cup that attaches to the eye drop bottle. While tilting your head, you place the cup over your eye. The cup holds the eye open while preventing you from blinking and directs the drops into your eyes. The Magic Touch Eye Drop Applicator looks like a silicone thimble you place over your index finger. You apply one eye drop onto the tip of the Magic Touch eye drop applicator; bring the fingertip device to bottom of your eye as if you intended to touch your eye. Keep your eye open and by capillary action, the eye drop ‘jumps’ onto your eye at when you barely “touch” your bottom eyelid. No need to tilt your head back. E-Z DROPS is a plastic strip that adheres to the eye drop bottle. The end of the strip has a reflective circle that allows you to see your eyeball when you place the bottle horizontally above your eye. The trick is to remain focused on the reflection of your eyeball while the drop lands into the eye.